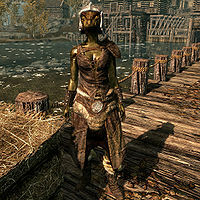 From-Deepest-Fathoms is an Argonian citizen who can usually be found wandering around Riften Fishery. When first encountered, From-Deepest-Fathoms will engage you in conversation and tell you in an almost babbling manner that you must take the Lexicon from her and free her of her burden. She will go on to say that the Lexicon must be returned to Avanchnzel. If you agree to take the Lexicon back, the quest Unfathomable Depths will begin. Once the quest is completed, her sanity is restored. From-Deepest-Fathoms wears a set of hide armor, including the helmet, bracers, and the boots. She wields an iron dagger and carries a belted tunic along with a selection of common loot and gold. From-Deepest-Fathoms will not appear until you reach level 14. Should From-Deepest-Fathoms die the quest can still be activated by taking the Lexicon from her coffin in Riften's Hall of the Dead. Pickpocketing the Lexicon will also start the quest. However, no dialogue options will be available. She will only tell you to take it to Avanchnzel. When distributing the missives of Mara, the dialogue will call her 'brother' instead of 'sister'. 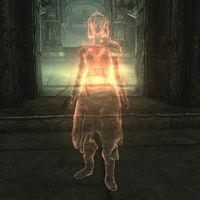 From-Deepest-Fathoms has a ghostly form that you encounter while inside Avanchnzel, which uses her second form ID and ref ID and is in the Dwarven Automaton Faction. This page was last modified on 31 March 2019, at 14:01.